Exploring more than 80 of the big ideas and key theories in the field of sociology in a clear and simple way, this is the perfect introduction to the study of how humans live and interact with each other. 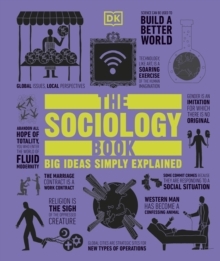 Covering diversity and equality, globalization, human rights, modern urban living, and the role of work and institutions, The Sociology Book looks at the big questions of how we co-operate: What is society? What makes it tick? Why do we interact in the way that we do with our friends, co-workers, and rivals?The perfect way to explore this fascinating subject, The Sociology Book profiles the world's most renowned sociologists and more than 80 of their biggest ideas, from the early pioneers Karl Marx and Auguste Comte to the groundbreaking work of Sharon Zukin and Judith Butler. Each sociological theory is made crystal clear with the help of quirky graphics, pithy quotes, and step-by-step summaries that explain each idea in an easy-to-grasp way.